Esta Convocatoria a la presentación de documentos y talleres está abierta a todos los especialistas de la información incluyendo bibliotecarios, archivistas, administradores de documentos y educadores en el campo de la ciencia de la información, así como a proveedores en la industria de la información. The Role of Libraries and Archives in Disaster Preparedness, Response and Research. Call for Poster Presentations. The President of the Association of Caribbean University, Research, and Institutional Libraries (ACURIL), Ms. Ardis Hanson, kindly invites you to submit your paper for the forthcoming conference held in Tampa, Florida, 30 May – 3 June 2011. This Call for Poster Presentations is open to all information specialists including librarians, archivists, record administrators and educators in the field of information science, as well as information providers. 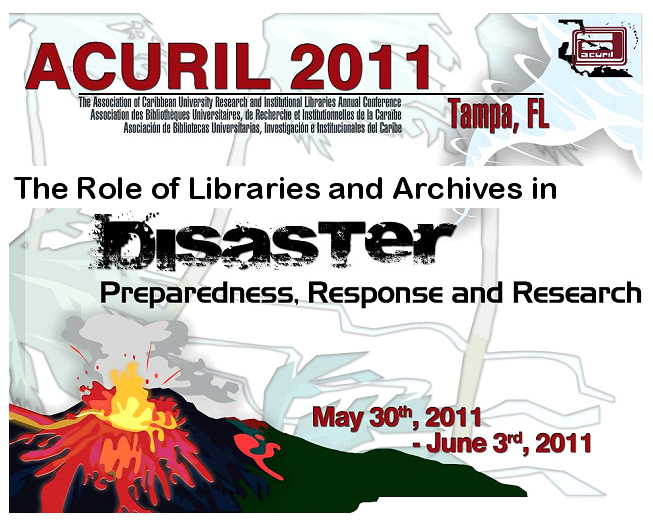 The President of the Association of Caribbean University, Research, and Institutional Libraries (ACURIL), Ms. Ardis Hanson, cordially invites you to submit your paper for the forthcoming conference held in Tampa, Florida, 30 May – 3 June 2011. This Call for Paper and Workshops, to be presented at the Conference, is open to all information specialists including librarians, archivists, record administrators and educators in the field of information science, as well as information providers.